1) Find a trusted neighbor and give them a key to your house or barn. Make sure this person is comfortable and familiar with your pets. Make sure the neighbor knows your pets' whereabouts and habits, so they will not have to waste precious time trying to find or catch them. 2) Create a pet emergency/disaster kit and place it in a prominent place where your neighbor can find it. 4) Make a Disaster Supply Checklist. Every member of your family should know what he or she needs to take when you evacuate. You also need to prepare supplies for your pet. Stock up on non-perishables well ahead of time, and have everything ready to go in the event of a disaster at a moment's notice. Keep everything accessible, stored in sturdy containers (duffel bags, covered trash containers, etc.) that can be carried easily. If you reside in an area prone to certain seasonal disasters, such as flooding or hurricanes that might require evacuation, create a kit to keep in your car. Food and water for at least 5 days for each pet, bowls, and a manual can opener if you have canned pet food. Pet beds and toys, if you can easily take them, to reduce the animal's stress. Other useful items include newspapers, paper towels, plastic trash bags, and grooming items. The single most important thing you can do to protect your pets is to take them with you when you evacuate. Animals left behind in a disaster can easily be injured, lost, or killed. Animals left inside your home can escape through storm-damaged areas, such as broken windows. Animals turned loose to fend for themselves are likely to become victims of exposure, starvation, predators, contaminated food or water, or accidents. Leave early; don't wait for a mandatory evacuation order. 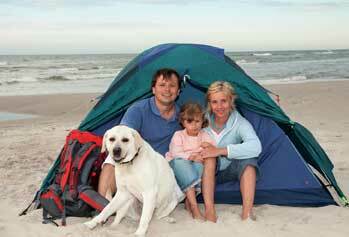 An unnecessary trip is far better than waiting too long to leave safely with your pets. Your pet should be wearing up-to-date identification at all times. This includes adding your current cell phone number to your pet's tag. It may also be a good idea to include the phone number of a friend or relative outside your immediate area-if your pet is lost, you'll want to provide a number on the tag that will be answered even if you're away. In the advent of a disaster, make arrangements well in advance for a trusted neighbor or friend to take your pets and meet you at a specified location. Be sure the person is comfortable with your pets and your pets are familiar with him/her, knows where your animals are likely to be, knows where your disaster supplies are kept, and has a key to your home. If your family and pets must wait out a storm or other disaster at home, identify a safe area of your home where you can all stay together. Be sure to close your windows and doors, stay inside, and follow the instructions from your local emergency management office. Bring your pets indoors as soon as local authorities say there is an imminent problem. Keep pets under your direct control; if you have to evacuate, you will not have to spend time trying to find them. Keep dogs on leashes and cats in carriers, and make sure they are wearing identification. If you have a room you can designate as a "safe room," put your emergency supplies in that room in advance, including your pet's crate and supplies. Listen to the radio periodically, and don't come out until you know it's safe.